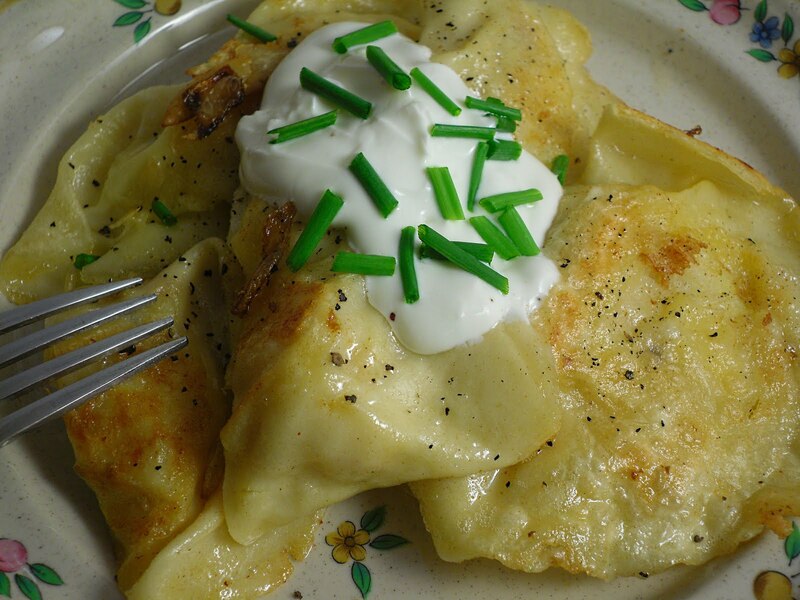 Pierogi are a traditional Polish noodle dumpling, filled with a variety of sweet and savory mixtures. I grew up with my Polish Cioci making these for us. My mom learned from her and so on down the line. When my mom would make these, we would set up an assembly line. She would roll out the dough and make the circles, I would add the fillings and close them up, and my father would boil them. Unfortunately, both of them are gone now and I have to make them on my own. I usually make them for the holidays, or just when we get in the mood for them. Next in line is my son's girlfriend. She is from Costa Rica and has no clue about Polish cooking. So i'm going to get her into the kitchen with me so she can learn to make these for my son. His favorite is with sauerkraut filling. The possibilities of fillings are endless, but these are the three that I make. Combine all ingredients and knead until well blended, about 5 minutes. You can either do this by hand or in your mixer fitted with a dough hook. Let dough rest 30 minutes covered with plastic wrap or a damp towel. For many years, we would roll out this dough by hand on a big wooden board that my father made for my mom. He also made one for me. I have a pasta machine now, and I use this for rolling out any or most dough that I make. 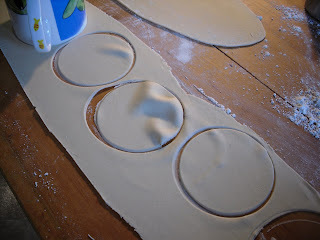 Divide dough in 8 pieces and work one piece at a time, keeping remaining dough covered. Roll to 1/8" thickness (Setting #5 on the pasta machine). Cut into 3" rounds. I use a coffee mug that measures 3" across. Anything will do. 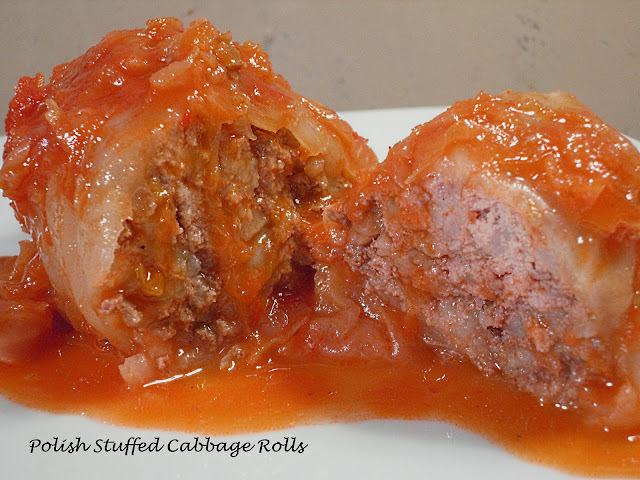 Place a heaping tablespoon of filling into the center of each round. Moisten the edges with water, fold over and press together to seal. Bring a large pot of lightly salted water to a boil. 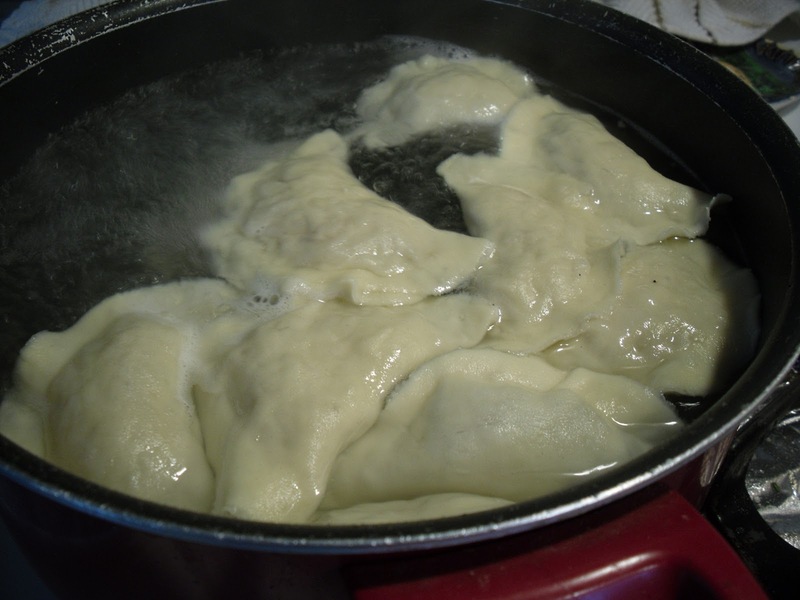 Add pierogi, without crowding and cook until pierogi float to the top. After they float to the surface, allow them to cook another 3 to 4 minutes. 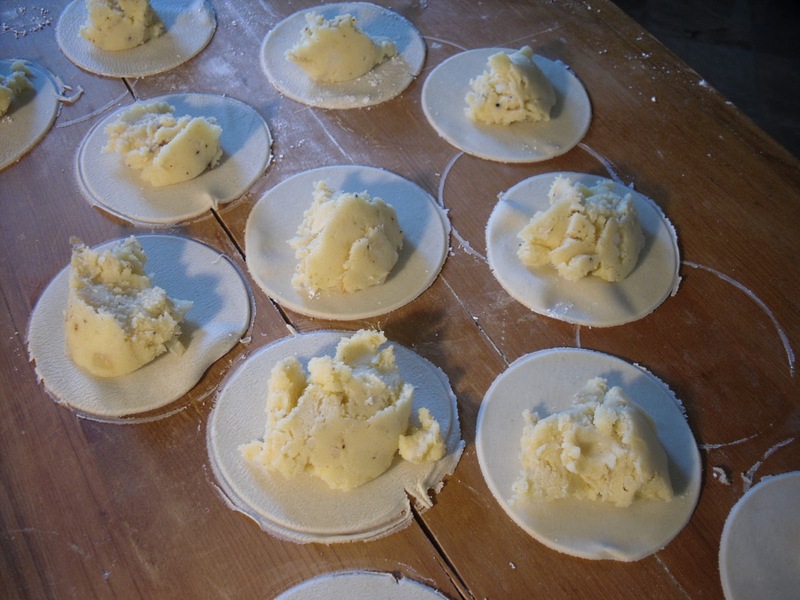 I put the cooked pierogi in foil pans in two dozen batches and drizzle with melted butter. Peel and cube potatoes. 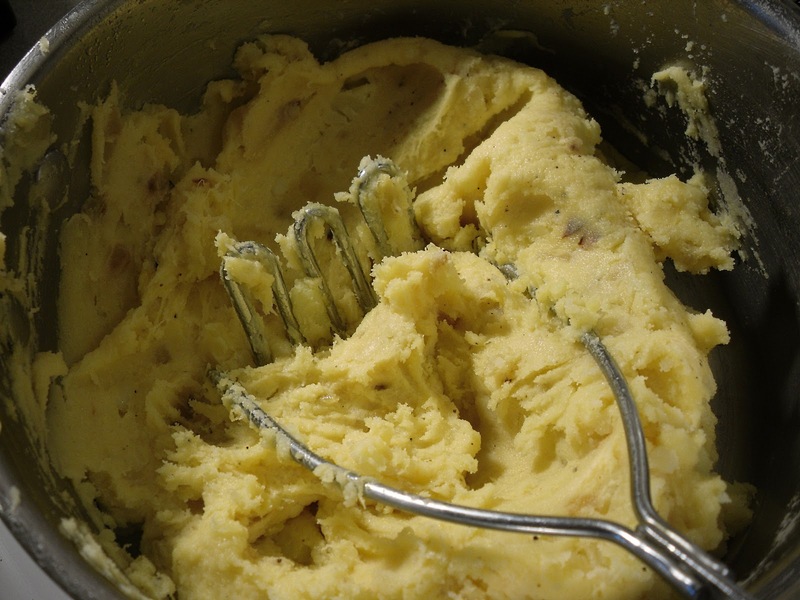 Cook in boiling salted water until tender just as you would do for mashed potatoes. While potatoes are cooking, melt butter in skillet and fry onions until caramelized. 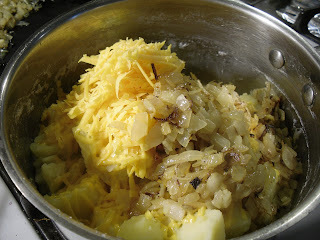 Use half of the caramelized onions for the potato-cheese filling and the other half for the sauerkraut filling. Drain potatoes, add half the onions and cheddar cheese and mix well. Add salt and pepper to taste. Let cool. 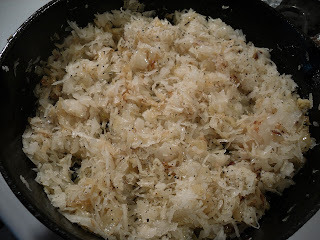 In same skillet used above with half the sauteed onions, add garlic and sauerkraut and fry for about 5 minutes until slightly softened. Salt and Pepper to taste. 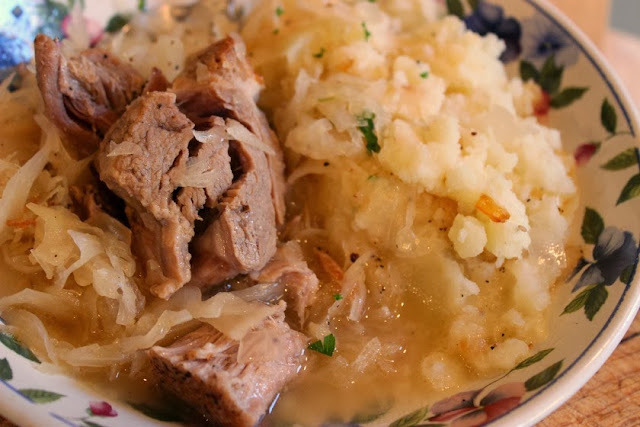 If the sauerkraut tastes too sour, add a pinch of sugar. Let cool. All fillings can be made the day before and refrigerated. This is a sweet filling. Not many have heard of this, but it's delicious and different.. In a saucepan, cover plums with water. Bring to a boil, remove from heat, cover and let stand 20 minutes. Drain the plums. Add lemon juice and sugar and cook until most of the liquid is gone. Put one plum in each dough circle and seal. Boil in lightly salted water until they float and boil an additional 3-4 minutes as above. Saute these sweet pierogi in 2 Tbs. unsalted butter, add 1 Tbs. sugar and 1 Tbs. plain bread crumbs. Dust with powdered sugar. I like to brown the butter slightly. Saute chopped onion in butter in a large pan until onions are soft. 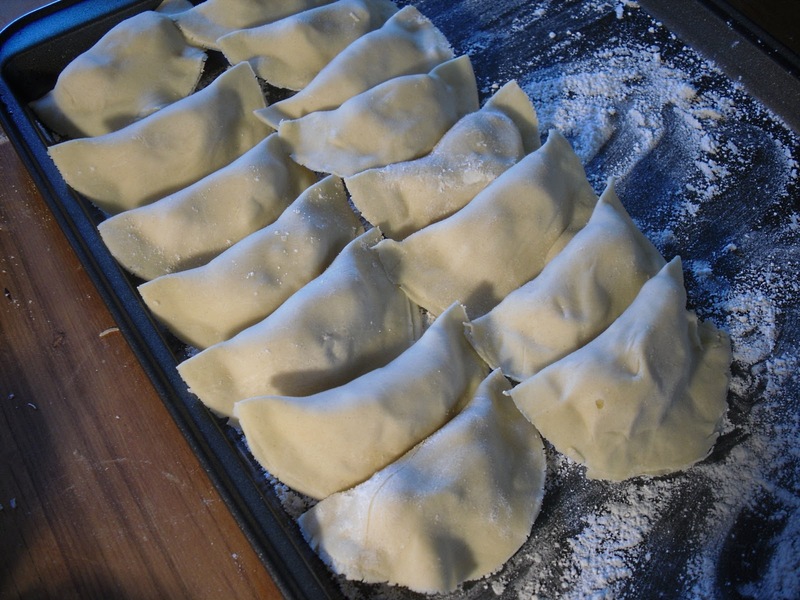 Add pierogies and fry until lightly browned and heated through. Whenever I am sauteing onions in butter, for any dish, my sons yell out "Ma - you making pierogies?" I love that! The smells from the kitchen and memories that last forever. Makes 4 dozen potato-cheese, 2 dozen sauerkraut, and 1 dozen plum pierogies. You can freeze these but there won't be any left. A half-day's work but a labor of love. You need to multi-task when you are in the kitchen! I have not had a good Pierogi in ages!! I am so happy you posted this recipe!! Patti, Thank you for pointing me toward this recipe. I was telling my hubby about them and he went wild! I guess his ex-wife's mom used to make them, and he LOVES them! I'm makeing them this weekend! They are also "to die for" with farmers cheese inside... yum! Mmmm... 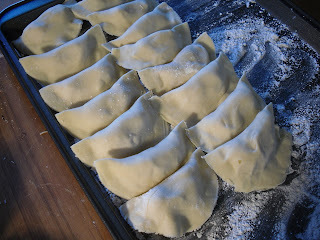 I will have to try my hand at these my daughter has been aching for a few months for me to try perogi's. These definitely look delish! Have a great weekend and happy cooking!